Our Ellis Army: Happy Birthday to Me! What's that, you ask? Wasn't my birthday in April? 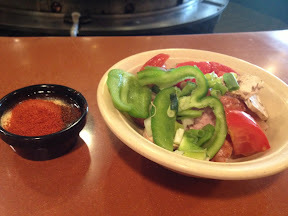 Why yes it was, but I only wanted one thing for my birthday: a trip to bd Mongolian! So today we dropped the kids off with Mim, loaded up with Brittany and Timmy and headed to Easton. 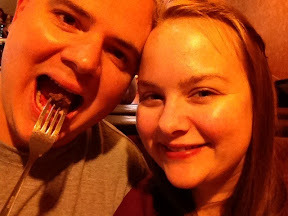 Yes, we drove 3 hours each way to eat, DON'T JUDGE ME! bd is pretty much my favorite restaurant on the planet and Columbus and Dayton have the closest ones. 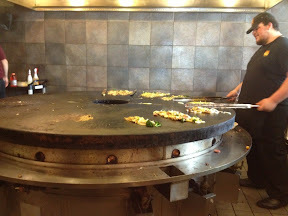 For anyone unfamiliar with Mongolian barbecue, you choose all the raw ingredients you want and the cook it on a huge Mongolian grill. Add cheese, tortillas and sour cream? ¡Delicioso! Tyler's second plate was ALL steak! 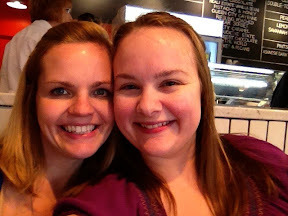 After we stuffed ourselves there we walked a couple blocks to Jeni's Splended Ice Cream! Holy moly! I tried Salty Carmel, Queen City Cayenne (chocolate ice cream with cayenne pepper, hot!) and Dark Chocolate. I went with Salty Carmel and Dark Chocolate (which I'm pretty sure is the best ice cream flavor I've ever had) in a waffle cone. SO good. As a matter of fact, I'm going to The Wild Ramp tomorrow to hopefully get some Dark Chocolate for home, I hear they have it. Here's Britt and I, after our glorious ice cream cones, in our signature pose (I have pics of us at every major event of our lives like this).